Julien Labro (accordion, accordina, bandoneon); Evan Perri (guitar); Carl Cafagna (saxophones); Paul Brady (rhythm guitar); Andrew Kratzat (acoustic bass). The family tree that traces its roots to the Quintette du Hot Club de France has sprouted countless branches across the globe in the seventy years since Django Reinhardt first jammed with Stephane Grappelli. 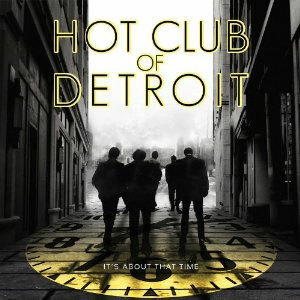 It seems like a new city lays claim to its own Hot Club on a virtually daily basis, but the Hot Club of Detroit is undoubtedly the apple that has fallen farthest from that tree. The blistering fretwork on the opening track of the group’s third CD, It’s About That Time, pays explicit homage to one of their six-string heroes – just not the one you might think. “On the Steps” is based on the chord changes of Pat Martino’s “On the Stairs” (with a brief borrowing from John Coltrane’s “Giant Steps” to complete the pun), and states at the outset what fans of these gypsy jazz revisionists have long known – that Django Reinhardt is far from the beginning and end of the Hot Club of Detroit’s vocabulary of influences. © 2010 Mack Avenue Records, Inc.